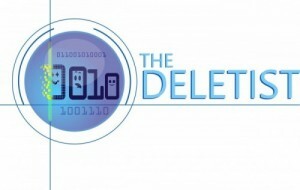 The Deletist – Page 2 – Be elite and delete. Save strategically! A few months ago I noticed some big changes in my online credit card account. The dashboard panel, which had always shown my credit card stats with numbers, was now displayed with colored graphs and charts. Now the dashboard shows me my current balance, as compared to my total limit, visually and numerically. 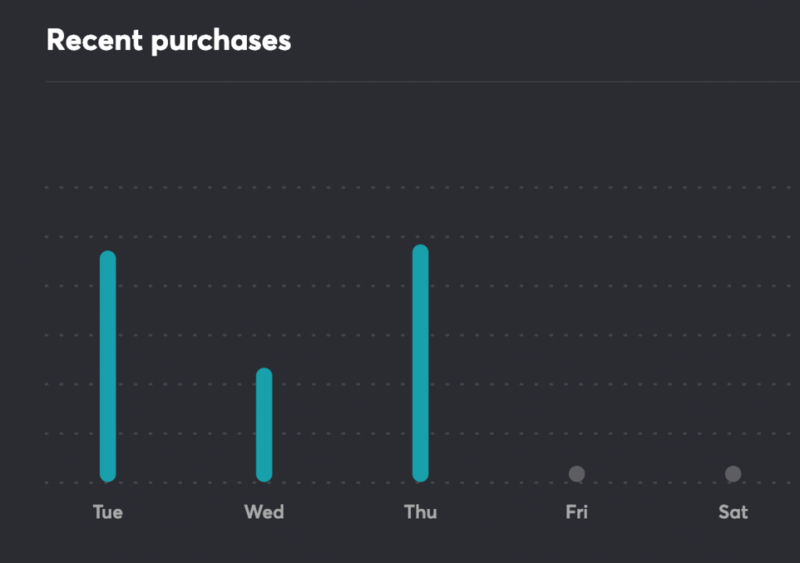 The dashboard shows me a wheel that indicates how much has already been credited and how much is pending against my total limit, by using different colors. It also displays my current balance, available amount, and total limit numerically. To the right of the balance wheel, I get an overview of how much I spent each day on my credit card, relative to other days. If I hover over the graph, I can get an exact number of how much I spent that day. From the dashboard I can go to the “Transactions” section. This gives me a detailed breakdown of all my transactions which I can then filter based on date, vendor, transaction type, or expense category. The credit card determines the category, which includes household, groceries, shopping, services, transportation and miscellaneous. From “Transactions,” I can look at “Trends,” a bar graph showing how much I spend in each category, or each day over a period of time. All of this is fine in theory, but my challenge is that the categories don’t match how I like to track my expenses and they’re not accurate. For example, my monthly health insurance payments get categorized as “miscellaneous” instead of “health.” I can’t change this. In general, I find the miscellaneous category problematic. As a records and information management professional, we’re trained not to use this word to describe anything mostly because it’s a word that can mean everything or nothing, all at the same time. I find this category assignment pretty useless and misleading. I suppose the goal of this is to give me more information about my spending habits. Perhaps then I can make better or more informed decisions about how and where to spend my money. I can notice patterns and identify which categories I spend the most money in. But if I can’t customize the categories, or at least have the option of reassigning transactions to the proper category, the end result is not that useful for me. For the most part, I’m a ruthless purger. In my early days of tossing, while I was still developing my style and methods, my mother used to worry that I was too reckless. That I got rid of too many things without thinking about them enough. I have to admit that I have had a few purging regrets over the years. But they’re small, hardly significant really, when compared to the vast numbers of things I’ve purged without any second thoughts. I still feel a little silly that I sold my Sergeant Pepper’s Lonely Hearts Club album. At the time I’d listened to it so many times that I was tired of it. I made a decision to pass it along and get something new for my collection. Some time later I came to regret that decision, but it was easily rectified by buying the album again. Every once in a while I’ll get a pang for something I cleared out that can’t be replaced so easily, maybe an article of clothing I used to like or a tchtochke that had meaning. But then I recall a fond memory of the item and trust myself that I made the right decision to let the physical object go. Then I move on with my day. I go through the same exercise for digital content, too. Many people focus on decluttering physical stuff without a thought about how inundated and overloaded we all are with digital content. The same rules and basic strategies apply. Here are couple of useful tips to consider when embarking on these types of cleaning projects. Follow through with your decisions and don’t waffle on your choices. Move things out right away (e.g., donation bin, recycling, trash, etc.) so you don’t have second thoughts about them. I once mentored two students at my job. Their task was to analyze 62 boxes of backlog records in the corporate vault to determine if we should keep them or destroy them. We reviewed their work and finalized the decisions. On their last day, I left them in the vault with a 96-gallon shred bin and a time limit to load up all the records to be destroyed. Then we locked the bin and went for coffee. The lesson learned was to feel confident about your decisions and complete the actions without hesitation and second guessing yourself. It’s hard to believe that so many weeks, so many years (almost six!) have gone by since I started The Deletist. When I launched my blog in June 2013, I thought about other blogs I enjoyed reading and wanted to create a similar experience for my readers. I wanted to post frequently enough for content to remain fresh, but not so much that it would feel onerous to read or to keep up with content if someone missed a few weeks. Out of these aspirations came two rules, post on Mondays and limit posts to 400 words. Data Dealer (parts 1 and 2). “Jellyfish” stands out as a favorite. 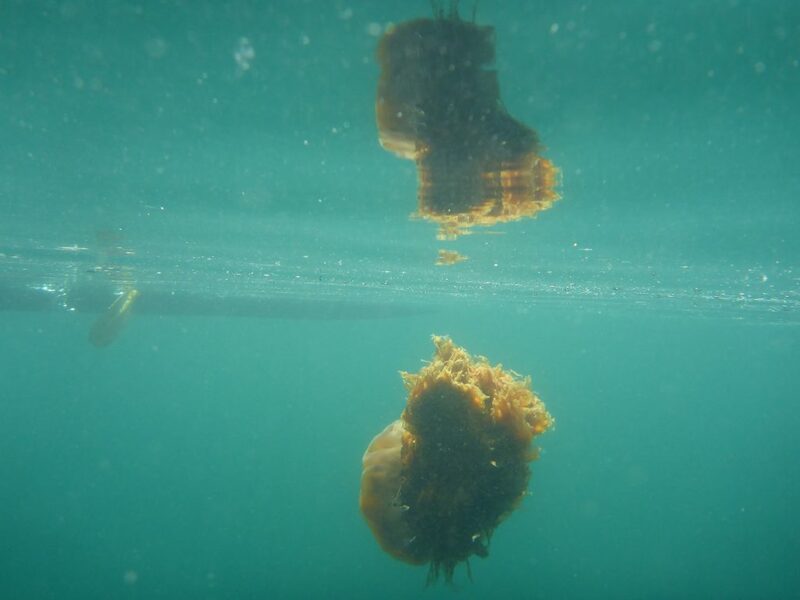 I was inspired by headlines about fake news and the desire to use this cool photograph I had taken of a jellyfish underwater, capturing its reflection on the surface. I’m always expanding my series, postings dedicated to a specific topic. I launched “Spring Cleaning” for posts related to targeted cleaning projects, on any scale. Two highlights for me are “Bathroom Hoarder,” how I finally managed to reduce toiletry expenses and waste by organizing my cupboards, and “Junk Drawer.” Everybody’s got one. “Deletion” is related to this category but focuses specifically on getting rid of things to make space for new things in our lives. “Productivity” is relatively new and features tips & tricks, or small strategies to make your life easier. Posts range from creating prep kits to breaking down large projects into manageable tasks. Two of my recent favorites are “Getting Unstuck and Finishing Tasks,” a true story of how it took me over 2 years to install lights under my counters and “On Being Nibbled to Death,” strategies to avoid getting overwhelmed with tiny things that pile up over time. “Iceland” was recently launched to showcase my latest adventure with my family on a tour with Overseas Adventure Travel. 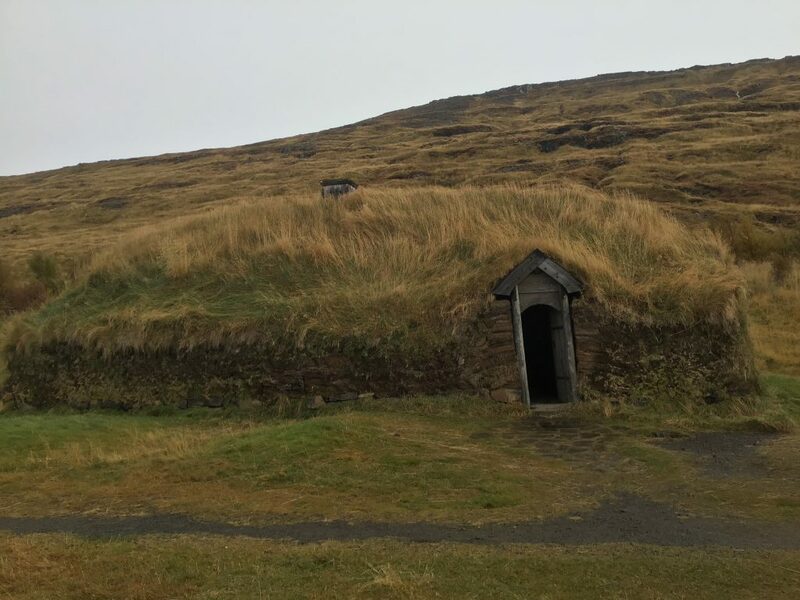 We left Stykkisholmur early in the morning and headed to our first stop, Eiríksstaðir, a Viking Long House. This was the type of house originally built by Vikings when they first came to Iceland. From the outside, it looks like part of the landscape, a grassy, hill-like structure with a sturdy wooden door in the front. Stepping inside, I was surprised by the high ceilings, the cozy feel of the interior and the lack of windows. A woman of Viking descent gave us a “tour” of the different features inside, including the types of tools that were used to survive in the early days. One surprising item she showed us was a sheep’s jawbone. None of us guessed that it was a toy her grandfather played with as a child. We emerged from the Long House and enjoyed the sweeping, peaceful landscape surrounding it. A few sheep stuck out as bright white spots against the greens, browns and grays. Some grazed grass near the trees, or by the river in the land below. After a quick trip to the souvenir shop, we boarded the bus for our next activity, the Gauksmyri Horse Farm. Iceland horses are special. They’re a breed of two different types of ponies and one type of horse. Among other things, they are highly prized for their natural ability to Tölt, the iconic gait of the Icelandic horses. 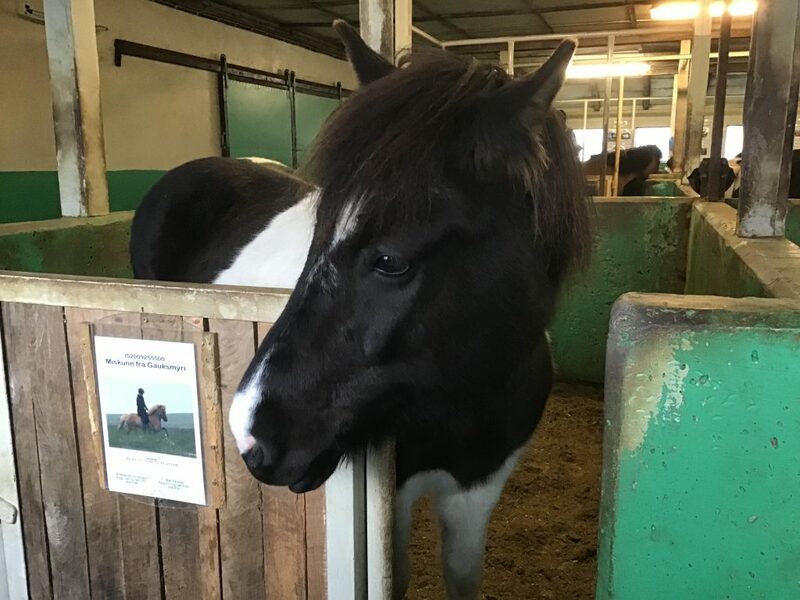 We ate a delicious buffet lunch complete with plates of horse meat before watching a demonstration of the five gaits and visiting the horses in the stables. I’m glad we ate the horse meat before we saw the show and visited with the horses. I wouldn’t have been able to eat it after spending time with the horses. Although we saw many, many waterfalls during our short trip in Iceland, Kolugjúfur stands out as a highlight in my mind. 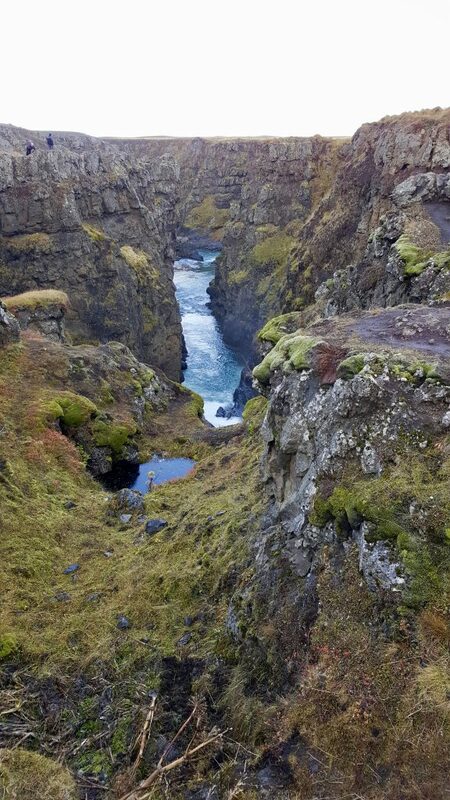 Kolugjúfur had three main parts of the waterfall which cascaded down into a gorge, decorated with a mosaic of mosses on either side. Standing below the falls with an extended view of the river below, felt like being in the pages of a fantasy novel. In the distance, snow-capped mountains extended underneath a mottling of gray clouds. I reluctantly boarded the bus, sad to leave this magical place. An hour or so later we were nearing Akureyri, our landing spot for the next 3 nights, in the northern part of the island. 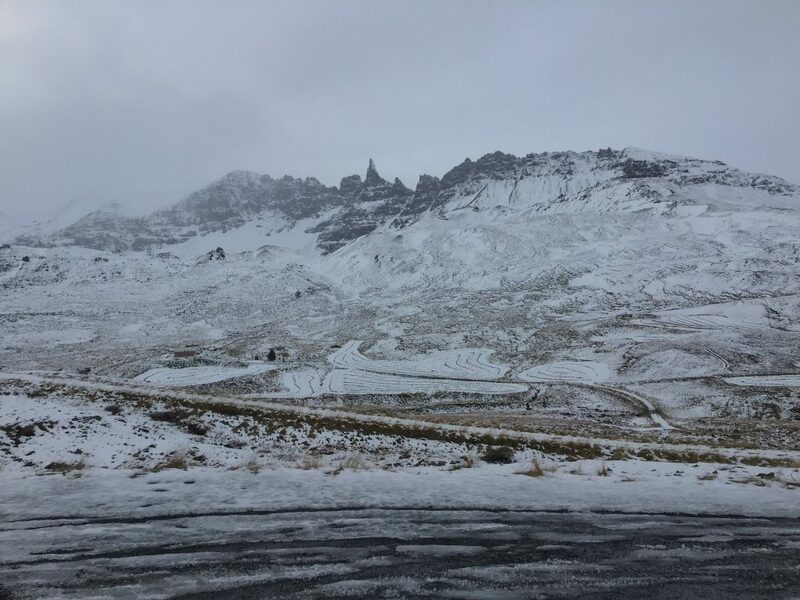 We encountered a snow storm on the way making some impressive patterns in the lava peaks at one of the viewing spots we stopped at. While listening to a podcast in January I was shocked to hear that one of the host’s New Year’s resolutions was to read the articles on his Twitter feed before retweeting them. I honestly didn’t realize people might retweet, favorite, or share articles without having read them first. It would never occur to me to share something that I hadn’t read first or at least skimmed through in its entirety. If I didn’t know what the article was really about, how would I know it was worth sharing? Some headlines are intentionally sensationalized to get people to read something, or it seems, to share it without even knowing what it was really about. These types of information distillations are everywhere. Instead of committing a few minutes to read through anything in its entirety, or to research the source, we’re seduced into thinking a few lines of catchy-sounding highlighted statements provide us with enough information to share something, or talk about it with authority. When dealing with a never-ending stream of information, each one of us has to devise a strategy to stay current with the things we care about in a way that doesn’t consume our time 24/7. There has to be a balance. I aim for balance with a two-part strategy. The first part is prioritizing quality over quantity. To accomplish this I limit the number of notifications I receive automatically by subscribing to a select number of services. If I’m interested in learning more about something, I can always perform additional searches. Every once in a while, I re-evaluate the automatic notifications. If I find that I’m consistently deleting them without clicking on the content, then I unsubscribe. The second part of my strategy is allocating time each day to read a few things. I’ve discovered that if I save interesting things to read later, this almost never happens. Instead, I reserve about an hour each day to read news, or articles related to my profession. I fit in the fun, leisure reading around that. Some months ago the motor started dying on my electric toothbrush. It was over 5 years old, a geriatric by today’s technology standards. As we shopped around for something new, I realized it might be difficult to find a replacement that only meet my basic needs: a sensitive setting (i.e., slower and gentler) and a timer. That’s it. The other fancy features are wasted on me. Everything available was much fancier and sleeker, fortified with the latest and greatest technology. We wouldn’t be able to replace my simple two-setting model with the same thing. Almost all the new models offered fancy settings to floss or polish your teeth, in addition to regular brushing. The most significant new feature was the capability to connect the toothbrush to your smartphone. We ended up with a new model that offers 6 specific settings and the smartphone-toothbrush connection.Admittedly, the new travel case with a built in charger will come in handy, but I’ve always been fine on vacation using a regular, manual toothbrush. As we were setting up the new toothbrush my partner’s reaction was “cool!” He immediately downloaded the app and figured out how the special suction-cup phone holder worked on our walls. I inwardly groaned already thinking that I would never be able to get dental insurance again. It’s just a matter of time before insurance companies will want us to submit our brushing records when applying for dental coverage or before agreeing to pay their share when we do go to the dentist. When properly connected, the smartphone tracks how often you brush and the duration of each brushing session. Oddly enough, it would only maintained one log for both of us. If you activate all the features, it will provide feedback through sensors on which areas of your mouth are being brushed too rigorously or not getting enough attention. While you’re brushing, you watch what’s happening on your smartphone, which is held tightly to the wall by the suction-cup apparatus. After the first few trial runs, one of which resulted in the suction-cup failing causing my partner’s phone to crash onto the floor, we haven’t continued to use it. And we never fully set up all the monitors and linkages between the phone and the toothbrush. At least for now I can maintain some privacy about my body and avoid technological surveillance in my mouth.